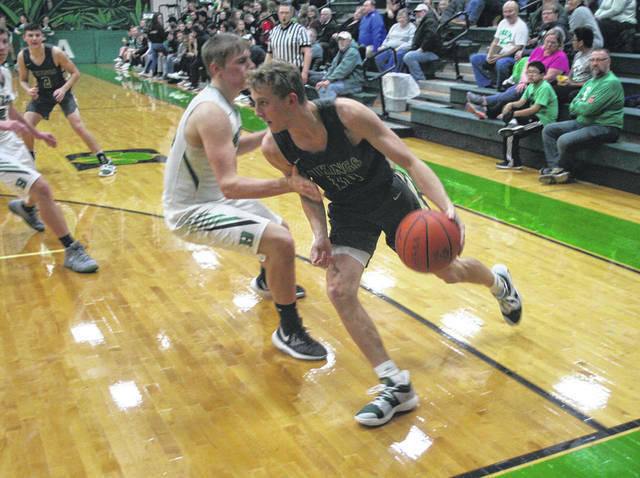 Chandler Lumbrezer of Evergreen drives around Hunter Tresnan-Reighard of Delta during Friday’s NWOAL boys basketball contest. The Vikings moved to 3-0 in the league with a 46-25 win over the Panthers. Nic Borojevich of Evergreen dribbles the ball in open space Friday in a NWOAL game at Delta. Delta’s Seth Burres goes up and snatches a rebound. 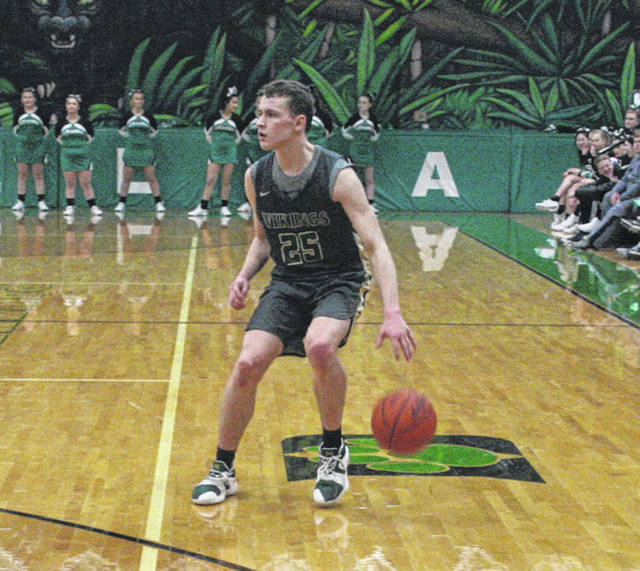 Evergreen didn’t really shoot the ball from outside well Friday night at Delta in boys basketball, going just 9 for 32 from the three-point line. But what the Vikings did do was pressure the Panthers into just 19 percent shooting and 20 turnovers to take a 46-25 win to stay in a first place tie with Archbold on top of the NWOAL standings at 3-0. “Our second group all week long did a great job simulating what Delta likes to do and running what they do,” explained Viking coach Jerry Keifer. “We got really good at defending those options and it really showed tonight. 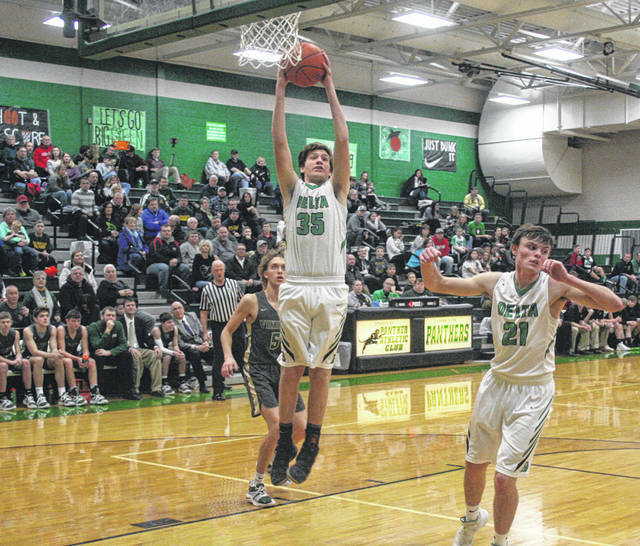 The Vikings broke away from a 5-5 first quarter tie with a 9-0 run that started innocently enough when Chandler Lumbrezer split a pair from the foul line with 4:06 left. In the next two minutes, Lumbrezer scored off the offensive glass, Nate Brighton meshed a triple from the top of the key, and Bryce Hudik began a personal three-point vendetta against the Panthers with a long triple – his second of the game – to give the Vikings a 14-5 lead with 2:08 on the clock. Hudik hit his next two triple tries around a long range shot from the Panthers’ Jarod Kurfiss to boost the Viking lead to 20-10. Jack Etue got one to fall from outside and Chandler Lumbrezer again struck from inside the key with five seconds left in the half to more than double the Evergreen lead, 25-12. Hudik continued his onslaught 32 seconds into the third with his fifth three-pointer of the night. Hunter Tresnan-Reighard tried to keep the Panthers in contact with three field goals in the third quarter, but those were countered by Chandler Lumbrezer’s steal and score, then two more buckets from in close from the senior lefty. Nic Borojevich hit a three-ball, and Zack Lumbrezer swooped in for a putback on one of his four offensive rebounds, to again allow Evergreen to double up the Panthers at 38-19. Ethan Loeffler’s free throw with 54 seconds left gave the Vikes their biggest lead in what turned out to be the final tally. Evergreen was just 17 for 46 from the floor but held the Panthers to 7 for 36. The Vikings enjoyed a 37-21 advantage on the glass led by Brighton’s 10. Hudik’s 15 points led all scorers while Chandler Lumbrezer added 13. The Vikings are now 12-2 overall and play Patrick Henry at home Friday night, followed up with a home date with Edon Saturday. Delta falls to 3-10. The Panthers travel to Bryan Friday and host North Central Saturday.